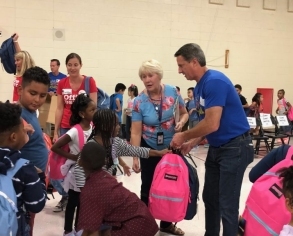 Bill Edwards, Domtar's vice president of manufacturing, handed out backpacks to students at David Cox Road Elementary School in Charlotte, North Carolina. Sept. 10, 2018 - 2018 marks the fourth year we have donated $100,000 to support Office Depot's back-to-school initiatives. Start Proud!™ is Office Depot's new community investment program, which benefits students, teachers and parents of public schools serving students from low-income families in select United States school districts. Under the new Start Proud! community investment program, Domtar partnered with Office Depot in five schools to bring paper and other school supplies directly to students and teachers in Florida, Texas, Pennsylvania and North Carolina. Rallies were held at each school to get students and teachers excited about the new school year. Bill Edwards, Domtar's vice president of manufacturing, spoke to the students at one such rally at David Cox Road Elementary in Charlotte, North Carolina. According to the Paper and Packaging Board's Fourth Annual Back-to-School Report, paper continues to be the preferred tool for productivity among students, teachers and parents. In fact, 89 percent of students in grade school say paper is essential to helping them achieve their academic goals. During the events, Office Depot made some surprise announcements at each school. According to a study by Scholastic, principals and teachers spend between $500 and $1000 of their own money for school supplies each year. To help express their admiration and thanks to all of these educators, Office Depot proudly donated six pallets of school supplies for all the teachers at each of the back to school events. Learn more about the Start Proud! community investment program, including the partnership between Domtar and Office Depot, in this brief video from the rally at David Cox Elementary School. Domtar is a leading provider of a wide variety of fiber-based products including communication, specialty and packaging papers, market pulp and absorbent hygiene products. To learn more, please visit: www.domtar.com.